Hey friends! Guess who has yet another citrus-y situation to share with you? And get ready for a few more in the coming weeks. 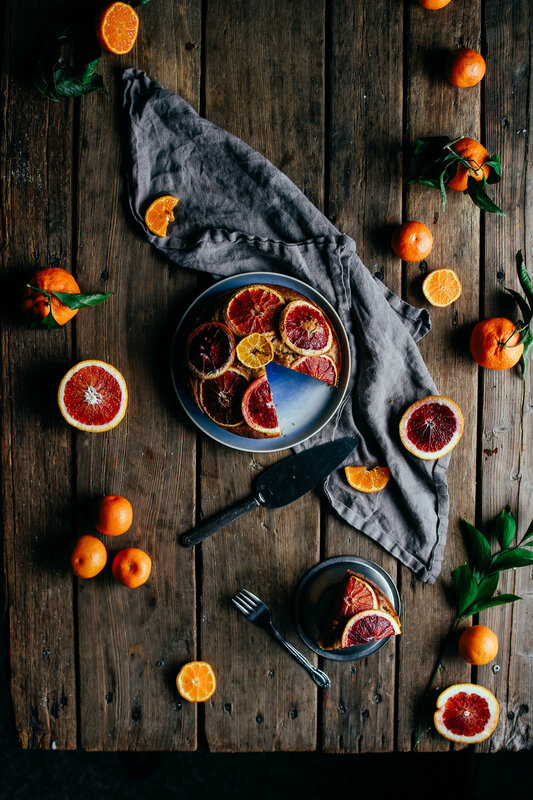 It's been so much fun experimenting with the different kinds of citrus this Winter, and blood oranges have 100% stolen my heart. Anyway, let's get on to the recipe. A buckle is kind of like a coffee cake, but a little denser, and oh so delicious. I used a smaller pan than Eva, and skipped the crumb topping in favour for more citrus slices on top, which maybe technically means mine isn't a buckle....but who cares! It's delicious, and I can't wait to make it again with fresh blueberries in a couple months! Preheat the oven to 375 degrees F. Grease an 8 inch pan, and line the bottom with parchment paper. I used a 7-inch springform pan here, and it worked well. You could also use a larger pan, simply adjust your baking time slightly if you do use anything other than an 8-inch pan. In a medium mixing bowl, mix together the flour, baking powder, salt, and cinnamon, and set aside. In a large bowl, cream together the butter, granulated sugar and brown sugar at medium speed, until smooth and slightly fluffy. Add in the eggs, one at a time, mixing well after each addition. Scrape down the sides of your bowl with a spatula to ensure it's completely mixed. Add in the milk, blood orange juice, zest, and vanilla extract, and mix on medium-low until just combined. Add in the flour in two batches, mixing until the batter is just mixed. I like to finish by hand with a spatula as not to overmix. Optional: sprinkle crumbs on top (see recipe below), and arrange very thinly sliced citrus slices on top. Bake cake for about 45-50 minutes, or until a toothpick inserted into the middle comes out relatively clean. Remove from oven when done, and allow to cool before carefully removing from pan and serving. Best served warm. In a small bowl, mix together flour, sugars, and cinnamon. Cut butter in using a fork or pastry cutter, until butter is all in pea-sized chunks, and well coated.